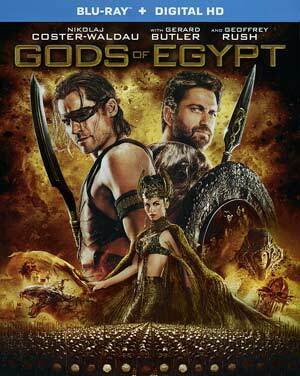 Gods of Egypt is a mess of a movie and the latest example that over-utilizes CGI to replace actual character development and story. This is a film that should’ve been a lot of fun but was a chore to sit through however on the plus side Gerard Butler seemed to be having a good old time. 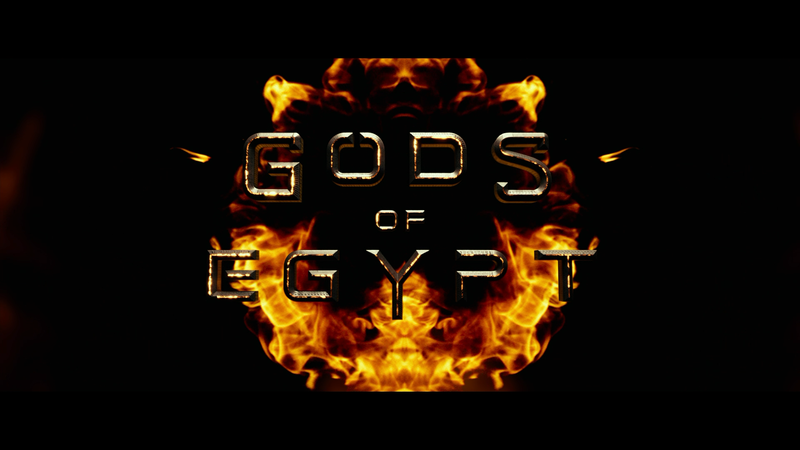 When Osiris (BRYAN BROWN), king of Egypt, is set to turn over the reign to his son Horus (NIKOLAJ COSTER-WALDAU), Lord of the Air, his other son Set (GERARD BUTLER) kills his father and takes down Horus in a duel, sparing him only after Horus’ lady, Hathor (ELODIE YUNG), the Goddess of Love, offers herself to him though he steals his eyes (the key to his powers). Upon taking the crown, Set enslaves the poor to mine for gold and build monuments including a tower to reach and honor his grandfather, Ra (GEOFFREY RUSH), the God of Sun. 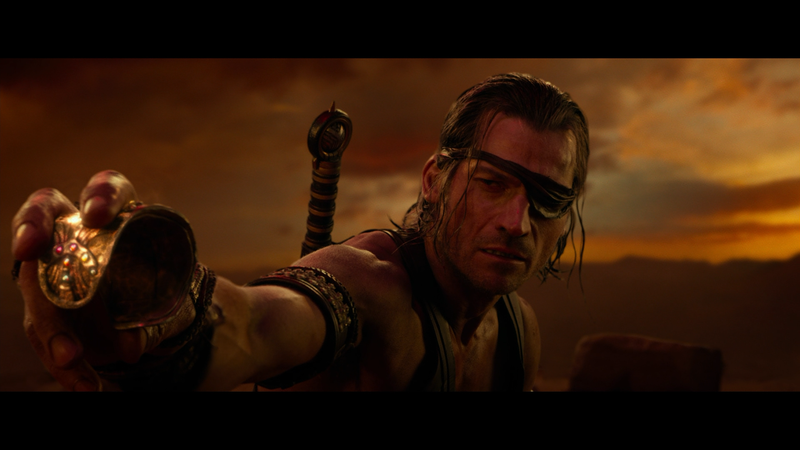 With Horus blinded and living in solitude and Zaya working as a servant to master architect Urshu (RUFUS SEWELL), Bek uses Zaya’s access to blueprints and breaks into a vault and after dodging Indiana Jones-esque traps, steals one of Horus’ eyes back and seeks him out in the hopes of defeating Set and freeing the Egyptian people. But upon escaping with Zaya, after being discovered by Urshu, Zaya is shot with an arrow, killed and sent to the underworld to travel to the gates where only those with riches may pass through while others are violently vanquished… or something. It’s a plot device to align Bek and Horus to get his other eye back so he may be at full strength to transform and defeat his uncle. And that’s really the plot. 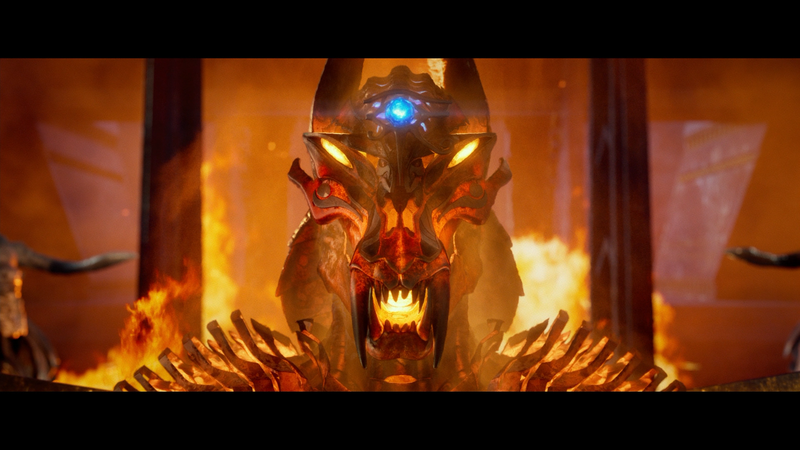 There are other characters encountered such as Thoth (CHADWICK BOSEMAN), the god of writing and knowledge, some deception at hand when Bek learns that in spite of promising Horus can bring Zaya back from the dead, it’s a supposedly impossible feat and, of course, some CGI-on-CGI fighting between the transformed versions of Horus and Set whose designs seemed to be inspired by Pacific Rim. The cast is actually isn’t half bad, though the controversy of it being too Caucasian was talked about, especially for a movie taking place and about Egypt, yet Gerard Butler, Courtney Eaton, Elodie Yung and Brentan Thwaites give fine performances while the latest attempt by an actor from “Game of Thrones”, Nikolaj Coster-Waldau, is more serviceable, but he lacks the charisma to carry the film, especially notable in the final speech. Rufus Sewell has a small role as a generic a-hole and Geoffrey Rush plays the usual cameo appearance but doesn’t get a whole lot to do. 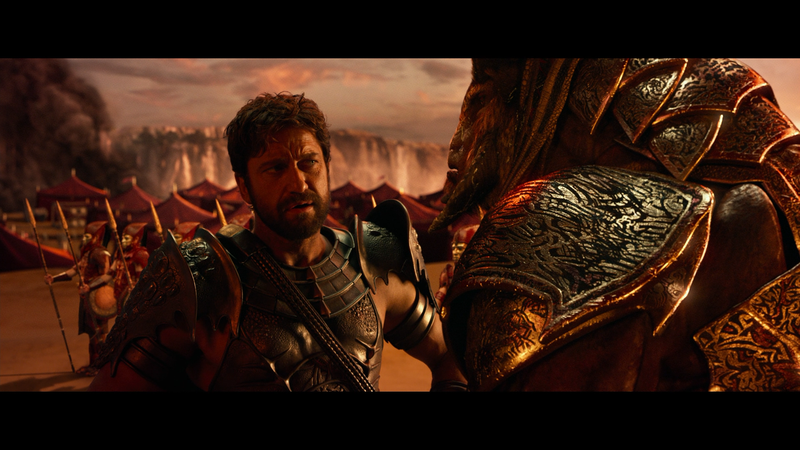 In the end, I didn’t feel Gods of Egypt was awful and there were moments where I was actually entertained, particularly whenever Gerard Butler appeared, chewing up as much scenery as possible to the point I was having a lot of fun. As a rental, this might be a worthwhile watch. A Divine Vision: Creating a Cinematic Action Fantasy (11:48; HD) is a behind-the-scenes featurette on how the film got made with interviews by members of the cast and crew. Of Gods and Mortals: The Cast (10:52; HD) breaks down the actors cast and the characters they play. Transformation: Costume, Make-Up & Hair (11:10; HD) delves into the nuance of filming with the costumes and make-up work done. On Location: Shooting in Australia (12:44; HD) is a featurette where filmmakers setting up shop down under. The Battle for Eternity: Stunts (11:38; HD) breaks down the stunt work performed in the film. Deleted Storyboards (5:45; HD) – You can check out two storyboards that never got filmed. 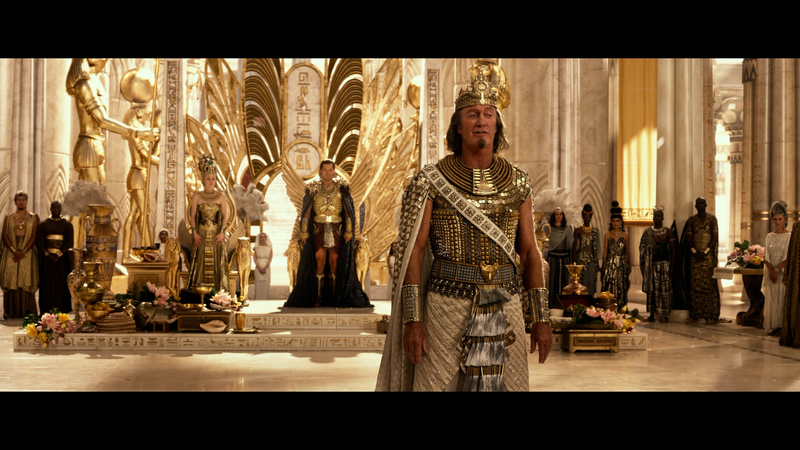 Gods of Egypt takes flight onto Blu-ray through Lionsgate presented with a 1080p high-definition transfer (MPEG-4 AVC codec) and shown in its original 2.40 widescreen aspect ratio. The picture looks amazing in high-def with bright colors throughout that really pops off the screen while detail looks good, however thanks to the overabundant amount of CGI, it does get a bit cartoony in spots. That said, it’s at least a clean transfer free of artifacts, aliasing and other flaws. The movie gets the new (well, newish at this point) DTS: X track which decodes to DTS-HD Master Audio 7.1 for older systems. Either way, this sounds fantastic showcasing both the quieter, dialogue-driven scenes as well as the numerous action sequences which really allows each and every channel comes to life with excellent depth and never overly heavy but even-keeled marking a perfect harmony for one’s home theater. Overall, Gods of Egypt has its moments but as a whole it’s not well made in spite of a talented enough filmmaker in Alex Proyas and a respectable cast, in particular Gerard Butler hamming it up to great effect; not to mention lovely actresses Elodie Yung and Courtney Eaton as love interests to the two leads. This is probably worth a rental, not much more. The Blu-ray released through Lionsgate offers good/excellent video and audio transfers and a decent set of features to peruse.